My good friend Susan from A little bit of heaven on a plate... is not only a champion marmalade maker (she won gold don't you know!) but she's an avid campaigner for keeping British jam the way it should be. She recently took on some jam meddling baddies at DEFRA in her quest to keep the fruity stuff as sweet as it should be. If you don't like sugar, eat a piece of fruit! I was inspired by her work and by a recent cake club I ran with the same theme as this month's challenge: Pump up the Jam! This month's challenge is quintessentially British. We want to see your perfect preserves, fantastic fruity numbers, marmalade mash ups and of course curd creations. If it involves jam, we're all over it! This month is a Blog Hop, so feel free to share - just pinch the code below! TIP: If you don’t have a blog you can still join in, just share the picture online (Facebook, Twitter, Instagram, Flickr etc), right hand click on it and copy image URL or link address. Add this to the Linky et voila! If you're on Twitter, tweet us a link to your post @dollybakes and @lauralovesbakes. 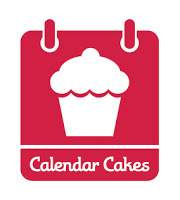 Use the handle #CalendarCakes. Ooooh, going to have to really think about this one & come up with a jammy dessert! I don't have ANYTHING on my blog! Thanks for tweeting me this!